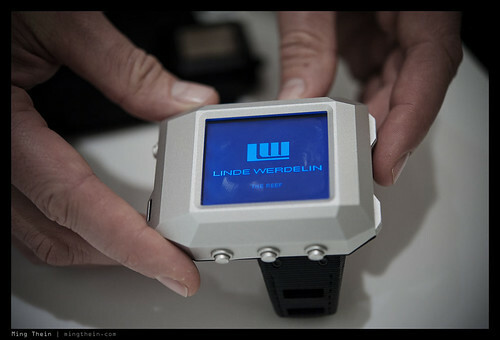 Linde Werdelin is a relatively new brand in the horological world, but one that’s already gained a solid number of fans of its unique timepieces. I spent some time with one half of the eponymous duo – Jorn Werdelin – during his trip to Asia, kindly hosted by The Hour Glass in Kuala Lumpur. What follows is less of your traditional Q&A and more of commentary and opinion. My colleague Robert-Jan has also had a SpidoSpeed on loan for a few weeks and will be posting a more in-depth review and photos soon. 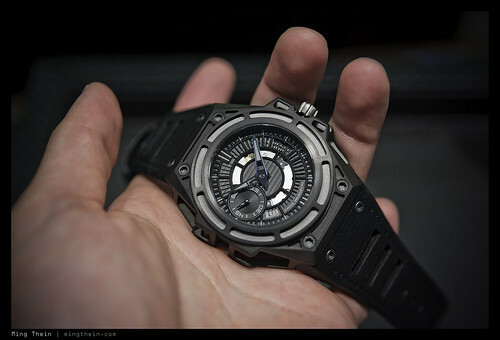 The concept of the LW-watches was born: a watch you can wear in casual everyday settings, but also has the ability to attach one of two functional modules as and when required – either a dive computer or a skiing instrument that comprises a compass, barometer, thermometer, chronograph, inclinometer and altimeter. Diving instrument. That backlight is insanely bright. 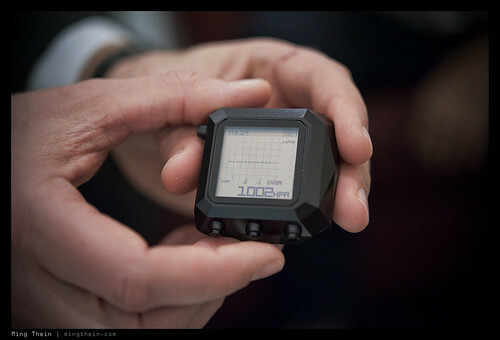 The dive computer is made of a highly corrosion resistant aluminum-magnesium alloy and filled with oil; it’s water resistant to 300m, though the sensor is only rated to 140m – apparently this is the deepest they go. In any case, common recreational diving tops out at just 36m, and few professionals go deeper than 80m. Both modules clip securely on to recesses milled into the watch cases; apparently it’s so you don’t have to leave your EUR10,000+ watch in the ski lodge or on the dive boat to free a wrist for your technical equipment. 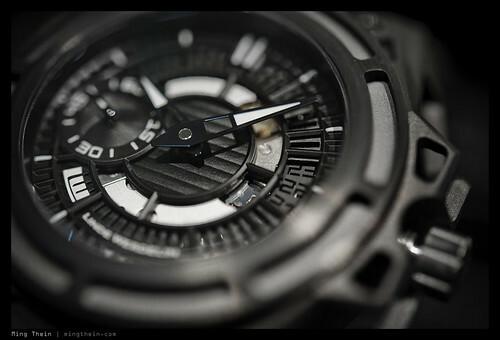 For some odd reason, my first impression on seeing the docking system in action was that the watch goes in and the LCD on the front displays a timing trace – similar to a Vibrograph timer. Jorn says it’s something they’re definitely thinking about – including perhaps some way of adjusting the timing. That just looks like a timing machine to me. Spidolite. Note shadow and holes! It’s an amazingly beautiful case; complex compound curves and void spaces bring to mind something sculptural and architectural rather than horological. Most of the time all the skeletonization you get is inside the movement. 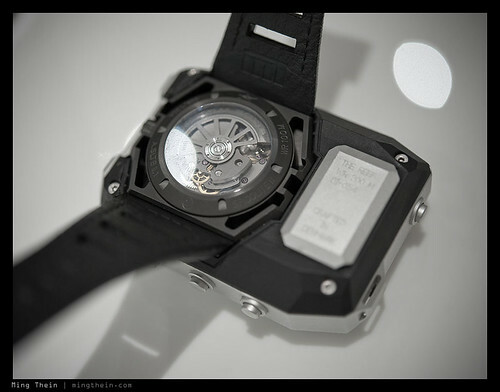 This is one of the watch world’s few skeletonized cases, and it looks fantastic. It takes about six hours to machine a case – which itself has several parts. “The outer [skeletonized] case requires machining this way, this way and this way [Jorn indicates three axes with his fingers]; and it has to be done slowly to prevent the case from warping. It screws together; there are top, middle and lower parts. 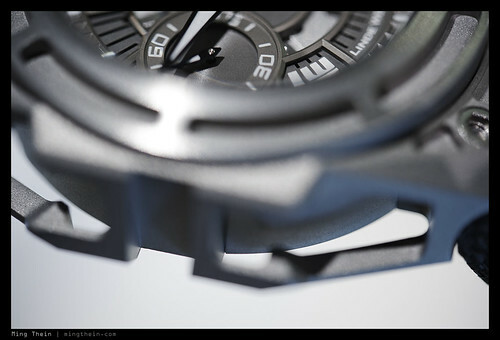 It’s a complicated case.” More interestingly, this case design allows the Spido models to maintain their 100m water resistance rating despite the amount of material removed. 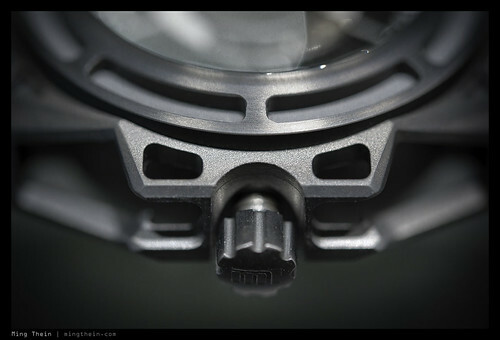 The edges are also finished by hand, to retain the crisp geometry and lines of the case but avoid any sharp edges that might cause injury to the wearer – so every one is ever so slightly different. It’s a fine balance. 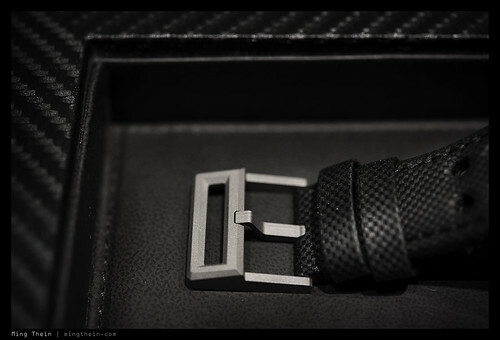 One other consequence is on the geometry of the strap attachment – it really isn’t designed for small wrists. 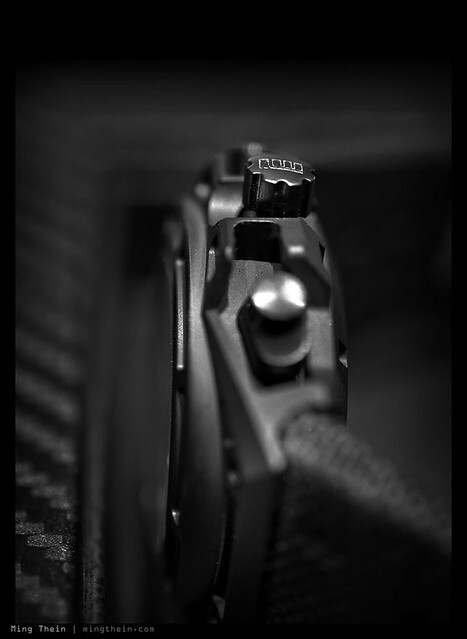 But Jorn assures me that there’s another attachment under development that replaces the standard screw in strap piece that allows the use of custom straps with standard pins; a welcome accessory to enthusiasts like myself with small wrists. Nice details in the buckle. 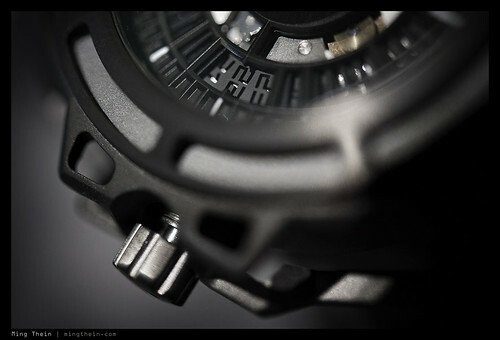 The dark gray cases (rather than black, to help appreciate the movement contours better) are also treated with a diamond-like coating (DLC) to increase hardness and scratch resistance. I ask about the DLC coating, but Jorn points out that the substrate is more critical to dent resistance. “What’s important is how hard the DLC is underneath. What we do is colesterize (?sp) the steel or titanium underneath; it’s a hardening procedure that increases the hardness by four times. 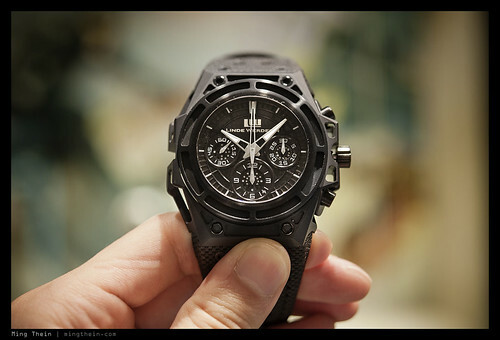 It’s an electrochemical process that changes the molecular structure.” The watch is then treated with one micron of amorphous carbon, creating the DLC coating. Since the underlying metal is also hardened, it is less likely to dent and cause flaking in the top DLC layer. I ask him why there aren’t any rotating bezels. 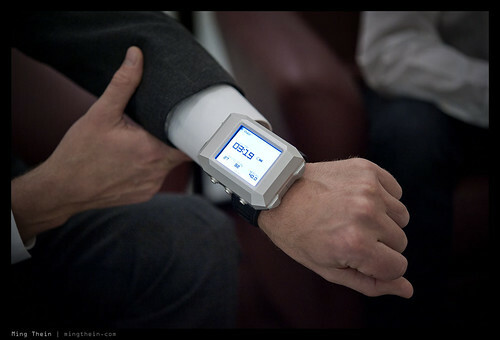 The answer is simple: the computer covers the watch anyway, and offers more functions. Plus “Why would you want a bezel where salt can get underneath, and few people remember to rinse their watches after diving anyway?” One less potential failure or corrosion point. So what’s next for the brand? The cases are getting solid again. 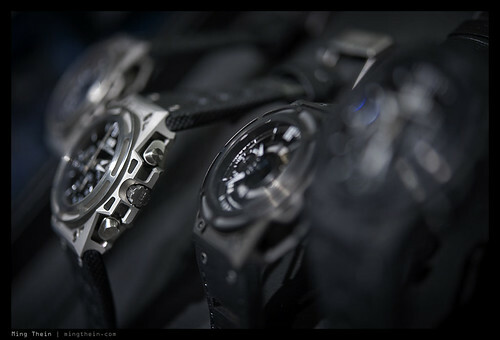 “We’re now reconstructing the Oktopus [diver]; it will be launched at Basel in 2012.” It too, will have similar case geometry to be compatible with the instrument modules. 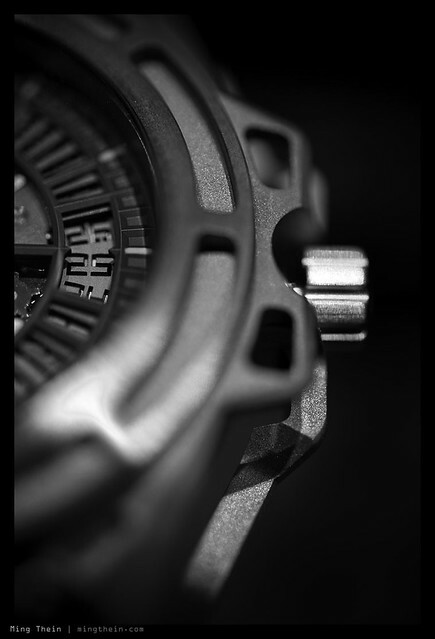 This necessarily limits the design of the case; Jorn sees this as a good thing because it means two things: consistency of design over time – a property of the most iconic watches such as the Royal Oak, Submariner or Luminor – and a commitment to existing customers to ensure future compatibility. I can see this being an iconic case one day. 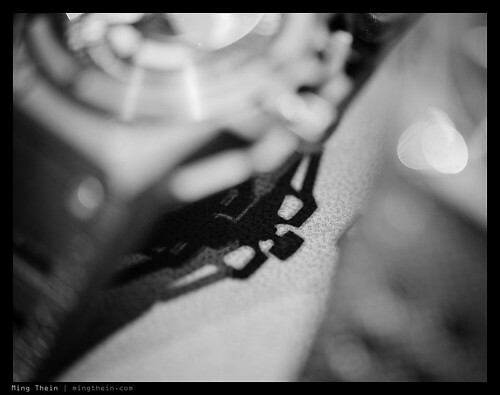 I ask about the movements: the chronograph appears to be a Valjoux 7750. I’m assured it isn’t; a small company in La Chaux de Fonds called Concepto uses the same architectrue but customizes the bridges, subdial layout and improves some functional components. It’s also slightly modified to work with the large integrated case pushers but deliver the same level of mechanical and tactile feedback from both buttons. 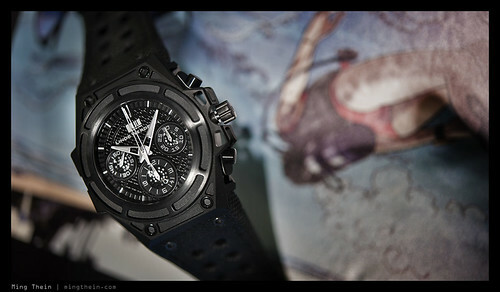 The refined movement now appears as a Concepto 2251. On closer examination, the finishing is certainly a level above any 7750 I’ve seen. 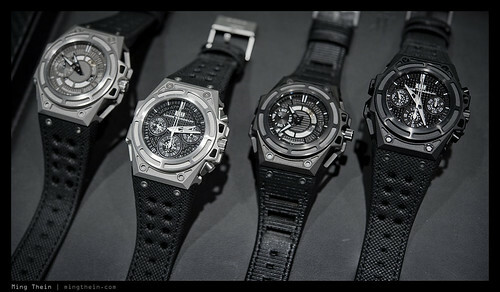 I’m told the time only models also have the same movement, but minus the chronograph plate. 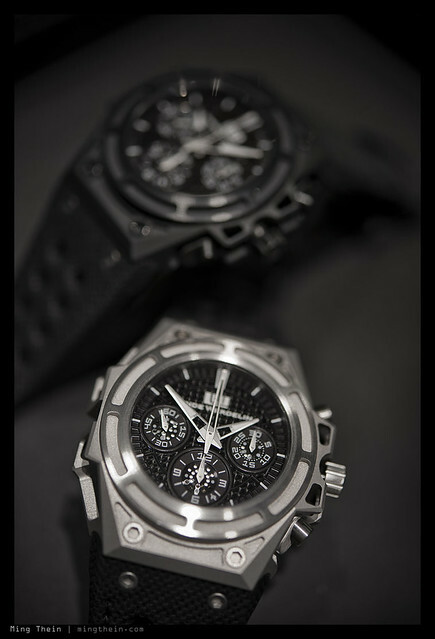 There are a couple of good reasons why they chose the 7750 architecture: robustness, and the integrated nature of the chronograph – the pushers are all at the same height. These are sports watches and have to stand up to hard use; the 7750 is a design that has over 30 years of testing and proof in the field for being robust and reliable. “It’s a sports watch; we wanted a movement that was sturdy and doesn’t break down.” Incidentally, it’s also a very high torque movement that’s suitable for powering other complications – look at IWC’s Il Desterio Scafusia, for example. Does this mean they’re restricted to these movements only? Hardly. 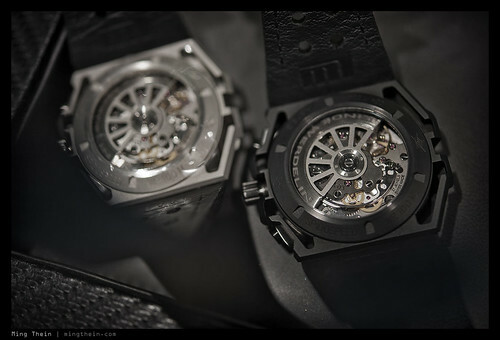 I point out the SpidoSpeed case has a couple of empty spots for extra pushers on the 9 o’clock side; Jorn merely smiles coyly and indicates that there are other complications in the works for the Oktopus and Spido family for release in 2013, and they’re working with a number of movement makers. 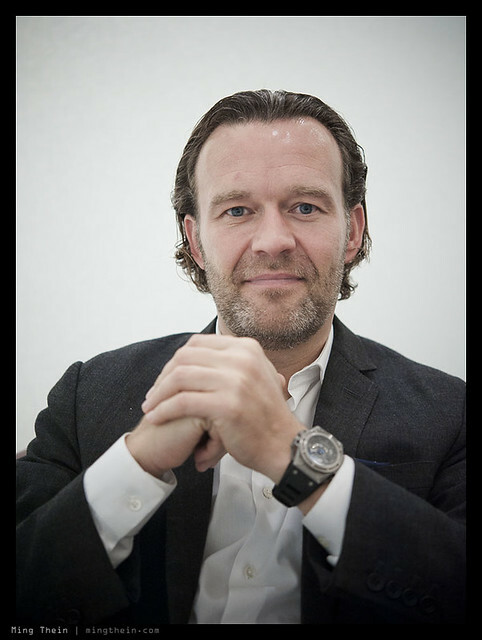 Jorn doesn’t see Linde Werdelin as having any direct competition; rather brands such as Panerai, Hublot, Audemars Piguet – the iconic sports watches – lead on naturally to Linde Werdelin pieces as their owners mature and start wanting something a little different. Current production is around 500 pieces a year; it’s a pretty exclusive club. Models are made in batches of usually around 100; after which refinements and customer feedback are incorporated, and a subsequent series is produced if the demand is there. One of the big advantages of the internet is the speed of feedback; Jorn says there’s no separation between himself and the customer – they can email him, and frequently do. It’s an opportunity for the brand to distinguish itself through direct interaction with the community. 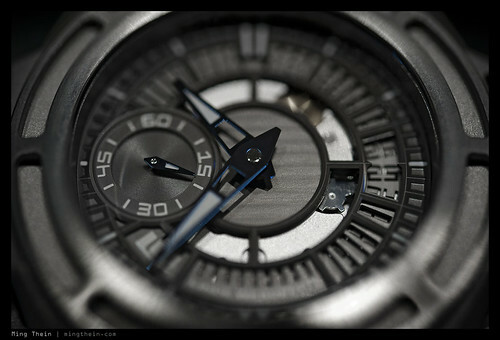 A good example is the crown of the watch; it’s honestly small and very difficult to operate. But I’m assured that this was one of the first issues raised through customer feedback, and a redesign is in the works. The crown could be larger, and stick out a bit further. But just look at the shape of that case! Interestingly, he doesn’t see internet sales – a contentious topic at best amongst most brands – as a threat, but rather something to be open to as they can serve a different sort of customer; some are buying the retail experience, some are intimidated by it and just want to buy the watch. It also makes sense to reach customers in remote markets; “Say we have a customer in Peru. We’re probably never going to have a store there, so we can sell to him directly or online. 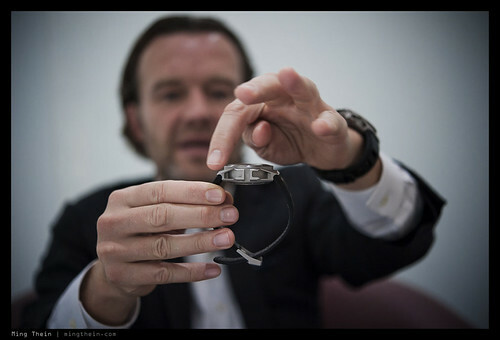 It’s about getting a watch on the wrists of people who want them,” says Jorn. It’s also about giving them that little bit extra – take the unique series of graphic illustrations, for instance. “It’s art,” explains Jorn; I have to agree. It’s also unique, eye catching, and a good way of creating an identifiable ‘signature’ for the brand. Social media just helps get it out there. 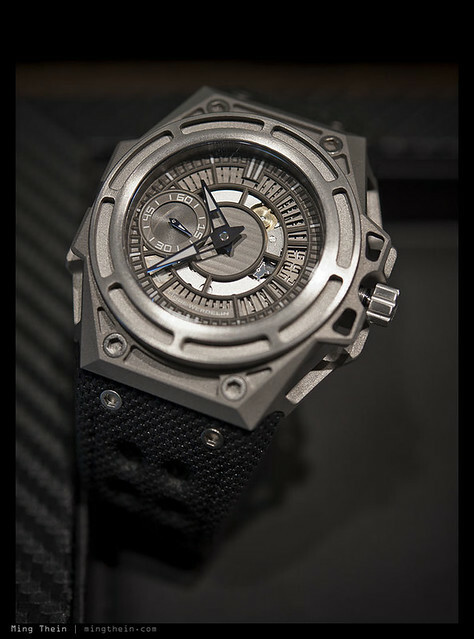 A special thank you to Jorn Werdelin, and The Hour Glass.